If you have growth ambitions for your online business, it is a good idea to think carefully about the processes from the beginning. We have more than 15 years of experience with automation and integration of systems. We integrate with most of the known systems, and have standard integrations with the following ERP solutions. Using Navision as the example ERP system, this video shows the seamless integration between eSeller Cloud and an ERP system. With the Integration functionality eSeller Cloud will be able to integrate to your ERP system, enhancing your productivity and enabling you to service your customers much faster, using the same resources. And for the Shop Administration you get a much higher visibility of your inventory status and product details, as they are automatically updated across your systems. Products in your ERP system wil automatically be created and updated in eSeller Cloud and sales orders from eSeller Cloud will automatically be imported to your ERP system – giving you a complete and up-to-date overview of your business. With our eSeller kit for Navision we are able to deliver a turnkey solution where XSLT transformation won’t be necessary – but as synchronization is done using XML files, integrating any ERP system capable of delivering files that can be transformed to XML will work just as easily. 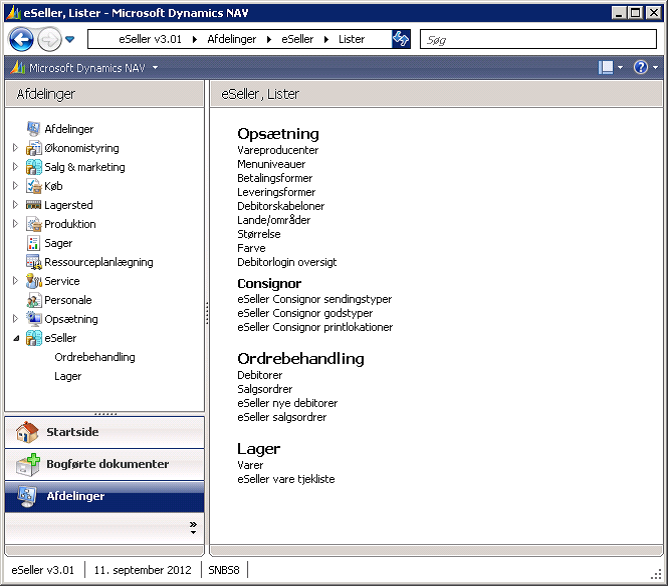 In the Resources section, you can find an example of an import file containing products from the ERP system. Do you want to learn more about integration? Then contact us today.